Definition at line 54 of file llfloatersellland.cpp. Definition at line 140 of file llfloatersellland.cpp. Definition at line 146 of file llfloatersellland.cpp. Definition at line 419 of file llfloatersellland.cpp. References LLPanel::childSetText(), mAuthorizedBuyer, mParcelSelection, refreshUI(), and LLParcel::setAuthorizedBuyerID(). Definition at line 458 of file llfloatersellland.cpp. Definition at line 437 of file llfloatersellland.cpp. Definition at line 411 of file llfloatersellland.cpp. References LLFloater::addDependentFloater(), callbackAvatarPick(), FALSE, LLFloaterAvatarPicker::show(), and TRUE. Referenced by onChangeValue(), and postBuild(). Definition at line 464 of file llfloatersellland.cpp. References LLViewerWindow::alertXml(), LLParcel::getArea(), LLParcel::getForSale(), gViewerWindow, llformat(), onConfirmSale(), and S32. Definition at line 444 of file llfloatersellland.cpp. References callbackHighlightTransferable(), LLParcel::getLocalID(), RT_SELL, send_parcel_select_objects(), and LLNotifyBox::showXml(). Definition at line 375 of file llfloatersellland.cpp. Definition at line 171 of file llfloatersellland.cpp. Definition at line 504 of file llfloatersellland.cpp. References gParcelMgr, LLUUID::null, PF_FOR_SALE, S32, LLViewerParcelMgr::sendParcelPropertiesUpdate(), LLParcel::setAuthorizedBuyerID(), LLParcel::setParcelFlag(), LLParcel::setSalePrice(), LLParcel::setSellWithObjects(), and TRUE. Definition at line 177 of file llfloatersellland.cpp. References LLPanel::childSetAction(), LLPanel::childSetCommitCallback(), LLPanel::childSetPrevalidate(), doCancel(), doSelectAgent(), doSellLand(), doShowObjects(), onChangeValue(), LLLineEditor::prevalidateNonNegativeS32(), and TRUE. Definition at line 278 of file llfloatersellland.cpp. References LLSD::asString(), BADGE_ERROR, BADGE_NOTE, BADGE_OK, LLPanel::childDisable(), LLPanel::childEnable(), LLPanel::childGetValue(), LLPanel::childHide(), LLPanel::childSetText(), LLPanel::childSetTextArg(), LLPanel::childSetValue(), LLPanel::childShow(), LLParcel::getName(), LLViewerUICtrlFactory::getTexturePickerByName(), llformat(), mAuthorizedBuyer, mChoseSellTo, mParcelActualArea, mParcelPrice, mParcelSelection, mParcelSnapshot, mSellToBuyer, LLUUID::notNull(), LLLineEditor::prevalidateNonNegativeS32(), setBadge(), LLTextureCtrl::setImageAssetID(), and utf8str_to_wstring(). Referenced by callbackAvatarPick(), and setParcel(). Definition at line 258 of file llfloatersellland.cpp. References BADGE_ERROR, BADGE_NOTE, BADGE_OK, BADGE_WARN, LLPanel::childSetValue(), LLControlGroup::getString(), and gViewerArt. Definition at line 190 of file llfloatersellland.cpp. References mChoseSellTo, mParcelSelection, mRegion, refreshUI(), and updateParcelInfo(). 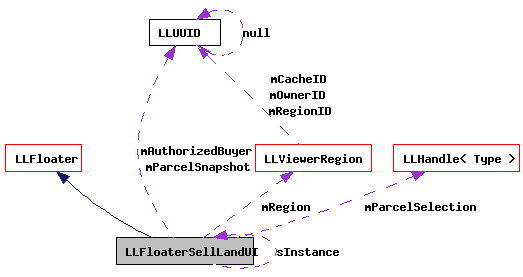 Referenced by LLFloaterSellLandUI::SelectionObserver::changed(), and LLFloaterSellLand::sellLand(). Definition at line 119 of file llfloatersellland.cpp. References LLViewerParcelMgr::addObserver(), LLUICtrlFactory::buildFloater(), LLFloater::center(), gParcelMgr, gUICtrlFactory, LLFloaterSellLandUI(), NULL, and sInstance. Definition at line 208 of file llfloatersellland.cpp. References LLPanel::childSetText(), LLPanel::childSetValue(), gCacheName, LLParcel::getArea(), LLParcel::getAuthorizedBuyerID(), LLParcel::getForSale(), LLCacheName::getName(), LLParcel::getSalePrice(), LLParcel::getSellWithObjects(), LLParcel::getSnapshotID(), mAuthorizedBuyer, MAX_STRING, mChoseSellTo, mParcelActualArea, mParcelIsForSale, mParcelPrice, mParcelSelection, mParcelSnapshot, mParcelSoldWithObjects, mSellToBuyer, and LLUUID::notNull(). Definition at line 69 of file llfloatersellland.cpp. Referenced by callbackAvatarPick(), refreshUI(), and updateParcelInfo(). Definition at line 65 of file llfloatersellland.cpp. Referenced by refreshUI(), setParcel(), and updateParcelInfo(). Definition at line 67 of file llfloatersellland.cpp. Referenced by refreshUI(), and updateParcelInfo(). Definition at line 63 of file llfloatersellland.cpp. Definition at line 66 of file llfloatersellland.cpp. Definition at line 62 of file llfloatersellland.cpp. Referenced by callbackAvatarPick(), refreshUI(), setParcel(), and updateParcelInfo(). Definition at line 68 of file llfloatersellland.cpp. Definition at line 70 of file llfloatersellland.cpp. Definition at line 61 of file llfloatersellland.cpp. Definition at line 64 of file llfloatersellland.cpp. Definition at line 76 of file llfloatersellland.cpp. 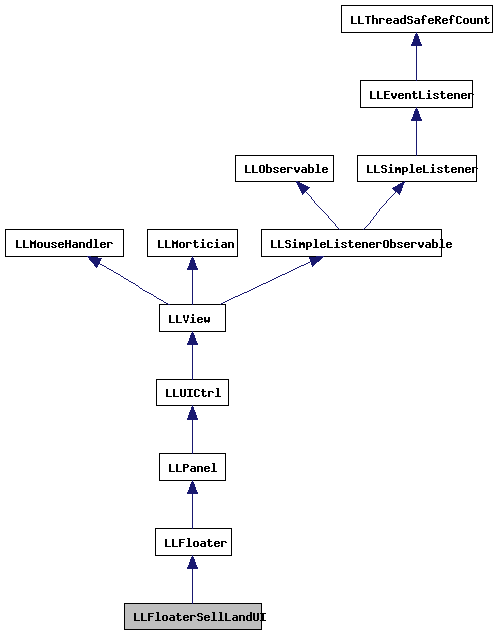 Referenced by soleInstance(), and ~LLFloaterSellLandUI().